The hand consists of 19 bones. 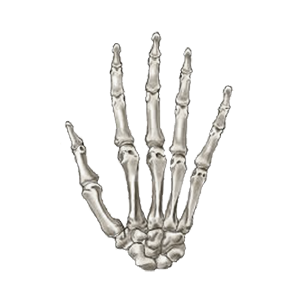 The palm includes five metacarpals, and each finger except the thumb contains one proximal phalanx, one middle phalanx, and one distal phalanx. The thumb doesn’t have a middle phalanx. Each bone is connected by a series of ligaments. Hand pain has many causes, including injury and disease. Fortunately, many of those causes can be treated and the symptoms eased.